Pablo Casals may have been speaking fifty years ago, but his ideas are still very relevant. The current trend to reposition classical music as entertainment bleaches it of humanity and purpose, and ultimately removes its raison d'être. The diagram above from a recent post attempted to capture this graphically and music teacher Liz Garnett has taken my theme and developed it admirably in a post on her own blog titled The 4 Es of classical music. At the core of classical music's present problems is an obsession with duality. A work is either a masterpiece or it is consigned to oblivion. A musician is either a ludicrously rewarded superstar or is consigned to the rank and file. Similarly music is either pure enlightenment or pure entertainment. Perhaps the solution is a middle path, a combination of entertainment and enlightenment. Such a path leads from perenially popular Vienesse operetta through Rutland Boughton's 'psychic drama' The Immortal Hour - which ran for 216 consecutive performances in London - to Leonard Bernstein's West Side Story. Bernstein's musical brought a new audience to classical music and is still breaking box office records, but where are its successors? More on The Immortal Hour in Music of the magicians. Fair comment Retha-Louise, and incidentally it is good to have a reader in Namibia. It was only a quick and dirty graphic to illustrate my thinking. 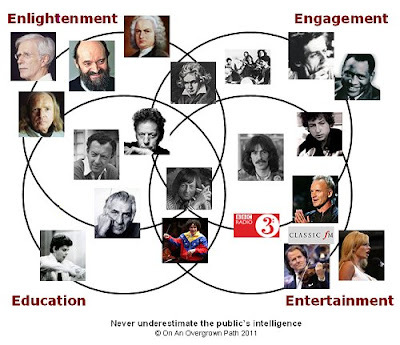 Dylan's position is on the entertainment to engagement axis, which I don't think is too far out. But I agree with you that George should be more in the enlightenment direction. But it has got people thinking, so the first part of the job is done. As Remembrance Sunday and Requiems are on top of mind at the moment I would throw one wild card into this discussion. John Rutter's moving 1985 Requiem received a number of performances in the States after 9/11. Rutter is sometimes viewed with condescension and categorised as a "crossover" composer. But if classical music wants to reach a broader audience it can learn a lot from his skilfull mix of enightenment and entertainment. "A work is either a masterpiece or it is consigned to oblivion." This sounds like the Steve Jobsification of classical music. Maybe it's the baby boomer ethos. Bodie, perhaps its the Twitter ethos. It is difficult to argue the middle path in 120 characters plus URL. pli, i love the idea of the middle path being the overgrown path, the fifth element, the quintessential. This post is a superb distillation of the current situation. Specifics and broad sweep in single sentences. Bravo. "If the poem's score for perfection is plotted along the horizontal of a graph, and its importance is plotted on the vertical, then calculating the total area of the poem yields the measure of its greatness." For what it's worth, though, I think your placement of Dudamel is bang on.